Each year the worlds largest accounting firms grow a little larger. With mergers and acquisitions the never ending competition for global supremacy seems to never end. With that said, as of 2019, these are the 20 biggest global accounting firms, all things considered. It comes as no surprise that Deloitte holds the number one global position. It’s hold on the top spot seems secure for the time being. Deloitte is located in more than 150 countries, and has over 600 offices in the world. The firm is headquartered in New York City, New York. They have most recently reached the 100-partner milestone when they merged with Curtis Mclean. Deloitte specializes in audit & assurance, tax, advisory, and risk. They offer a wide range of services that include strategy, financial and technical, and human capital. Deloitte’s closest competition over the last few years has and continues to be PwC (PricewaterhouseCoopers). 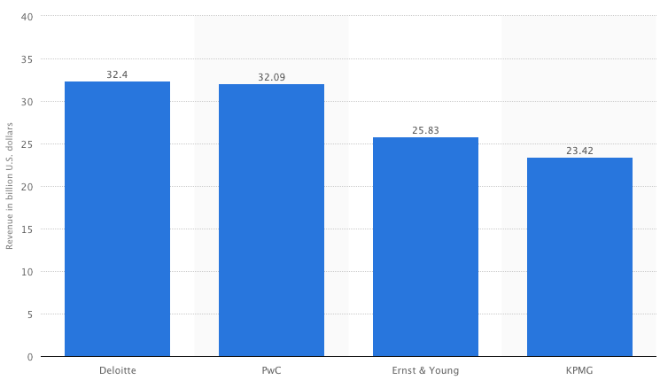 PwC comes in as the second largest accounting firm in the world. PwC has locations in more than 150 countries and more than 750 offices worldwide. Unlike Deloitte, they are headquartered in London. The firm has most recently merged with Booz & Co, a medium sized consulting firm. The merger was approved on December 23rd, 2013. They offer a wide range of services but they specialize in audit & assurance, tax, and consulting. Ernst & young earns the number three position in global accounting firms. This firm operates in more than 150 countries, utilizing more than 700 offices worldwide. They are globally headquartered in London. In recent history the firm has acquired Greenwich Consulting, adding 7 more offices to its roster, and more experience in strategy consulting. Holding firm at number four, KPMG comes in as the last of the big four, but still far ahead of the number five firm on our list. The firm operates in over 650 offices located in over 150 countries around the world. They are headquartered in Amsterdam, Netherlands. In recent news, the company has recently merged its Denmark operations with those of Ernst & Young. The merger will allow the company to offer more services to its clients while providing more support for that particular region. Grant Thornton UK is number five in the top 20 firms and is an arm of Grant Thornton International. The firm has 26 offices spread across the UK and specializes in audit, tax and advisory services. Most recently they merged with PFK to bring more services and locations to its clients in the UK. The firm is headquartered in London. BDO ranks number six and is headquartered in London. The firm has more than 1,200 offices in 138 countries. They recently added to their capabilities and offices through the acquisition of Alpern Rosenthal. The merger will allow BDO to expand its operations in both Pittsburgh and Florida. The firm specializes in audit, tax, and advisory services but has much more to offer its clients. RSM Tenon Group comes in at number seven out of the top 20 firms in the world. They are headquartered in London, and currently operate out of more than 700 offices located in more than 100 countries. The firm recently announced the merger of its China firm with that of Crowe Horwath’s Chinese firm to create a new firm called Ruihua China CPA’s. The new firm has requested to be a member of both Crowe Horwath China and RSM China. Smith & Williamson holds the number eight position in the world. They are headquartered in London, and hold more than 550 offices in over 100 countries. The company hasn’t merged with any other firms in recent history but is a part of M&A International and Nexia International. Baker Tilly is number nine on the top 20 list in the largest firms in the world. They are headquartered in Chicago, hold more than 580 offices in more than 110 countries. In June 2013 the firm merged with Holtz Rubenstein Reminick LLP. The merger will add 25 firms to Baker Tilly’s already larger list. Moore Stephens UK holds the tenth spot on the top 20 list of firms and is headquartered in London. They are a part of Moore Stephens International which has more than 620 offices in more than 100 countries. The UK division recently merged with Winx, corporate finance, and X-Stra, business consulting. The merger will allow the firm to expand their corporate finance sector. Mazars, headquartered in London, holds the number eleven position. The firm has more than 13,000 employees in more than 70 countries. They recently merged with Chadwick at their Liverpool and Manchester branches. The merger will allow the company to expand in the area where they did not have a great presence before. Haines Watts holds the number twelve position on the top 20 firms in the world. They are currently headquartered in London, have more than 60 offices in the region. The firm is part of Geneva Group international. The company recently merged with Ocean Consultancy Limited. Crowe Clark Whitehill is headquartered in London, and has more than 160 firms operating in more than 105 countries. They specialize in audit, tax, and advisory services. The firm has not completed any mergers recently, however they did win the Accountancy Firm of the Year award in 2012. Saffery Champness is headquartered in London and currently operates out of 12 offices. They are part of Nexia international which has a very large network of firms throughout the world. Saffery Champness specializes in audit, tax, and advisory services. The firm recently acquired 4 other firms in 2012, boosting their performance and rankings. Begbies Traynor is currently ranked as the number fifteen firm out of the top twenty. They are headquartered in Manchester England. UHY Hacker Young is headquartered in London, and currently operates out of 260 offices across the UK. They are ranked at sixteen out of the top 20 firms in the world. The firm specializes in tax planning and business growth. Although the firm has grown over the years they haven’t acquiesced or merged with any other firms in recent history. Kingston Smith is number seventeen on the list of top twenty accountancy firms. They are currently headquartered in London and has 7 offices across London and the Southeastern portion of England. In December 2013 the firm merged with PFK. Zolfo Cooper specializes in advisory and restructuring services. They are headquartered in London and have a plethora of offices around the globe including the UK, US, and other countries. They recently merged with Kroll Inc.
MHA MacIntyre Hudson is located in Buckinghamshire, UK. They currently operate out of 40 offices across the UK. They specialize in audit, tax, and governance. The firm most recently merged with Kent firm Larkings which has added six new partners and 2 offices. Johnston Carmichael is number twenty out of the top 20 accountancy firms in the world. They are headquartered in Aberdeen, Scotland and have 11 offices across the region. The company merged with PFK in September 2013. The firm specializes in audit, tax, and advisory services. Working for one of the worlds top accounting firms in a privilege and an honor. Your job at one of these firms can open doors to other opportunities that never would have been available otherwise. For those interesting in becoming one of the accountants, here is a simple 7 step process getting hired by one of the worlds largest firms. Without knowing where you want to go, there is no way to know how to get there. • Where do I want to work? The US? The UK? Asia? • Is there a specific firm you want to work for? Why? • What do you prefer, taxation, analysis, auditing? • Do you eventually want to start your own small business? • Will you want to promote to a senior (or higher) position? • Does being a CFO at another business sound appealing? Answering these questions should give you a rough idea of what type of career you’re gunning for. With that idea in mind, you can identify what credentials are required (degrees, certifications, licenses, etc…) That information will get you started on step #2. With your ideal accounting position in mind, conduct some basic online research to learn what qualifications are required for that job. For most of the world’s largest public accounting firms, a bachelors degree in a minimum, with a masters being a plus. Passing The CPA Exam is also important, but you typically aren’t required to pass that before starting your career. A fresh High School Graduate and a ‘change of career’ mom in her late 20’s aren’t likely to follow the same path to their ideal job. But our basic advice for all aspiring accountants is this. If you can afford the tuition costs, and have the grades to get into a top university, that’s probably the best way to go. But for those who don’t have the time, money, or grades to do that, here are your options. Online schools don’t have the best reputation, and for most of them, there is good reason. However, there are a handful of accredited high quality institutions that offer worthwhile degrees that you can earn on your own schedule. 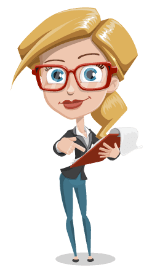 Getting some kind of accounting experience is very important for new accountants. Canvas colleges for recruiting opportunities as well as visiting firms to inquire about becoming a volunteer or intern. The best accounting firms in the world look for new hires that have some kind of experience. 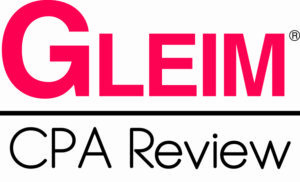 You can take the CPA Exam before or during your internship or first job, but we advise to do it before, if you can. The CPA Exam is very difficult and you’ll need every bit of focus to pass. 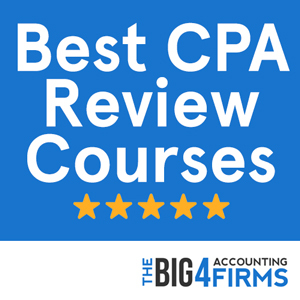 Most people use some type of CPA review course to help them study for the exam. This can be difficult to accomplish while working at a firm. However, the plus side to taking the exam while employed is that most large accounting firms offer some kind of incentive for passing. Hopefully by now you have some hands-on experience and are ready for your first full-time paid position. Just like most jobs, a resume or CV will be required. You can find hundreds of tips on crafting the perfect resume online, so we won’t go through all of that right now. Our basic advice is to first establish that you are qualified for the position, then show how you are different from everyone else. This can be personal or professional achievements, volunteering, difficult situations you managed, anything really. Just make sure to stand out. If your resume passed the first filter you’ll likely be called in for an interview. Again, you can find all sorts of tips on interviewing online, but we recommend two things. 1) Express your interest in very specific parts of their business. Ask them questions they aren’t expecting to be asked. 2) Relax and pay special attention to your attitude and demeanor. At this stage in the process, most candidates meet the qualifications, and often they are looking for people they will get along with. Be that person. If you’ve followed all the steps so far, there is a good chance you will be hired. Congratulations! Now the real test begins. When you start working, show up early, stay late when they need you, and the be the person they can count on. First impressions can last a career, so make sure to put your best foot forward. 7. Manabat Sanagustin & Co.